I have previously discussed that entropy based thermodynamics needs to be rewritten. Part of the reasoning is the poor association of an expanding system’s apparent randomness increase to lost work, as defined by PdV, by that system. Instead lost work: W(lost)= (PdV)(atm) now can be best understood in terms of thermal and/or potential energy, which is irreversibly passed onto the surrounding atmosphere by expanding systems. 1) In order for the atmosphere to do work onto a system then the atmosphere has to be at a higher pressure than that system. 2) In order for the atmosphere to pass heat/thermal energy onto a system then the atmosphere has to be at a higher temperature than that system. When considering an isothermal isobaric expanding system then the atmosphere is never at a higher temperature or pressure than the expanding system. Rather the now expanded system and surrounding atmosphere are generally at the same pressure and temperature after expansion. Certainly we now understand irreversibility without the requirement of the delusional entropy based second law. Seereversibility and/or expanding piston cylinder. Although clearly defined by PdV the lost work can numerous forms such as the simple upward displacement of our atmosphere. Or it may initially result in regional atmospheric pressure increases, which results in either a) an increase to the intermolecular collisions resulting in heat (remember that intermolecular collisions inelastic). Or b) that regional pressure increase will then try to expand resulting in a volume increase and/or intermolecular collision increase. Accordingly, an expanding system results in an increase in the atmosphere’s potential energy and/or a more direct heating of the atmosphere via molecular dissipation i.e. inelastic intermolecular collisions producing heat. Either way the thermal energy contained within our atmosphere has increased. And do not forget: If a volume is removed from the atmosphere then the atmosphere’s gas molecules experience an increase in kinetic energy (potential becomes kinetic), which results in the heating of the atmosphere’s molecules i.e. kinetic energy increases are associated with temperature increases i.e. the in kinetic energy increase another way of adding thermal energy (heat) into our atmosphere. 1) Adding potential energy via upwardly displaces our atmosphere. The total of 1) and 2) is defined by: W(lost)= PdV. Consider the steam engine, which is really based upon boiling i.e. 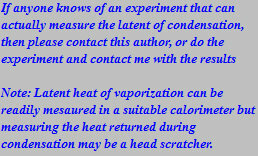 latent heat of vaporization (AKA: enthalpy of vaporization). Herein, as water boils it changes state and thus results in lost work as is defined by: W(lost)= PdV. There is another way of viewing the energy a car gives into the atmosphere. Consider you are driving between two towns separated by a long flat road. It takes energy to accelerate the car, which then gives the car inertia. Due to this inertia: If it was not for drag (form of viscous dissipation between moving car and atmosphere), and other frictional factors i.e. friction between road & car, friction between moving parts within the car etc, then the car would keep going on going. In other words all the energy you use when driving except for that used to accelerate your car, goes into heating the atmosphere in one form or another. And when braking all your car’s inertia in transformed into heat i.e. for disc brakes; between your brake pads and rotors. Food for thought! You may ask what about the change in molecular bonding potential (U) between the liquid and gaseous states. Well that is not lost work because it can be regained once the liquid condenses. And of course the reasoning is that evaporation involves lost work (PdV) while condensation does not! One has to realize that we previously wrongfully explained why useful systems are never 100% efficient via the second law. Of course accepting that the atmosphere has mass and that its upward displacement requires work is no different than accepting that a rock has mass, and that its upward movement requires work. Furthermore accepting this then we must now realize that thermodynamics as is traditionally taught is fraught with errors. Are all sources of energy subject to the inefficiency associated with lost work. Yes and no is my answer. Let me explain. Hydro generated electricity has no expanding system when produced nor when using therefore in theory hydro-electricity can power man and/or machine and not be associated lost work. Herein the only lost energy would be that associated with friction i.e. line loss which decreases with increasing voltage. Of course friction will cause heat, which will increase the temperature of the Earth’s atmosphere but understandably this would be considerably less heating of the atmosphere than say a steam engine. Is all electricity void of lost work? No, just consider electricity production. Lost work occurs when burning coal or other fuels are used to drive the turbines that produce electricity. For example lost work occurs whenever we make steam from water in order to drive turbines (Rankine cycle). Therefore, even when making nuclear reactors that use their nuclear power to make steam and then drive a turbine, which generates electricity, there is a step that involves boiling, hence lost work, hence even nuclear plants result in extensive amounts of heat I going into the surrounding atmosphere, over and above what one may traditionally consider as heat being transferred. The point becomes that many processes we use to generate electricity involves lost work but using electricity itself does not necessarily involve lost work. So we can say that hydro generated electricity is true clean energy but all generated electricity is not. By true clean I mean no lost work nor any generation of smog i.e. smog is also created when we use burn coal to generate electricity. Specifically, hydro dams do not involve lost work because they are powered by water going downhill, making hydro (hydro dam electricity) a true clean energy. But what about the evaporation process that makes the rain, which runs into rivers to power the hydro dam. Certainly, the evaporation process involves lost work but this is work lost by nature not man. Let me explain: The atmosphere’s energy (sun’s rays help) cause the water in the ocean in evaporate and this involves lost work but it is abuse of the atmosphere's energy by nature. The water then forms raindrops and that lost work is never recovered when rain falls, because it was lost in the evaporation process and can never be regained during the nucleation of the raindrops. So lost work even occurs in nature and this helps keep nature balanced. All of which directly heats the earth and atmosphere, hence causes evaporation which involves lost work thus also indirectly contributes to heating the atmosphere. Now one has to be suspect here on how we envision this because the energy required for evaporation actually comes from heat in the oceans and atmosphere. And then much of the above heat radiates from earth into space, as a lower temperature radiation that being blackbody of a few hundred degree. See: Global warming models. If you have a science related website and want to have links attached here please contact us and we will see if links are suitable.